Description: Fans of E. D. Baker's The Frog Princess, rejoice! 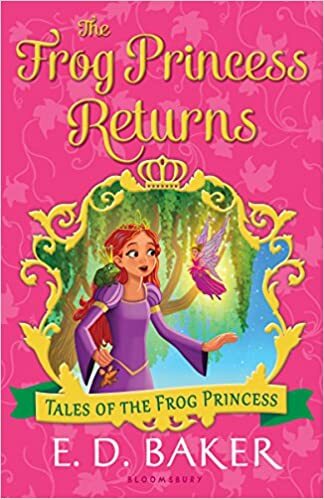 Fifteen years after the original, Princess Emma, Prince Eadric, and all the beloved characters are back for another magical adventure from popular author E. D. Baker. My Thoughts: Emma and Eadric are adjusting to being true loves and planning their wedding when a couple of things get in their way. First, lovely Princess Adara arrives from Lower Muckworthy and tries to steal Eadric away from Emma. Second, the fairy queen has disappeared and those campaigning to be the new fairy queen are causing dissension among the fairies. Emma, Eadric, with tagalong Adara set off on an adventure to find the fairy queen and restore order to the fairies. They are also trying very hard to discourage Adara in her plans to steal Eadric away. This was a fun story filled with entertaining characters and situations. Fans of earlier books in the series will certainly enjoy this one too. "Eadric, you are so brave! Adara cried. "I would have gladly watched you slay each and every spider, if Emma wasn't afraid of them." "Oh, please!" I said as I turned the carpet around.